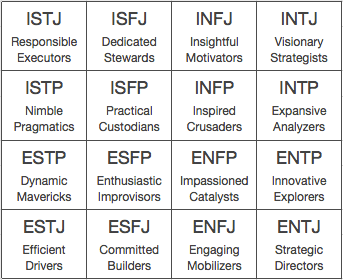 What is the MBTI (Myers-Briggs Type Indicator)? The MBTI® (Myers-Briggs Type Indicator®) is the most powerful personality instrument to enhance leadership capabilities, improve communication, and boost team effectiveness. The MBTI® personality inventory is based on the theory of Personality Type by Carl Gustav Jung. Carl G. Jung was one of the greatest psychiatrists ever and the founder of Analytical Psychology. Based on his theory, Katharine Cook Briggs and her daughter Isabel Briggs Myers developed the MBTI®. With over 70 years of studies, the MBTI® is the world’s best researched and most widely used personality instrument. More than 3.5 million people take the assessment each year and 70% of all Fortune 500 companies use it. People who prefer Extraversion focus their attention on the outer world of things, people, and events around them. They are often perceived as friendly, verbally skilled, and easy to know. They derive energy from being with other people. Typically they do their thinking as they speak. People with a preference for Introversion focus their energy and attention on the inner world of thoughts, ideas and reflections. They are typically quiet and perceived as reserved and harder to know. They re-charge their batteries when being on their owns. Usually they take some time to gather their thoughts before they speak. Sensing refers to taking in information primarily with the five senses: hearing, seeing, smelling, tasting, and touching. People with a preference for Sensing pay attention to facts and details. They want to understand the parts first to comprehend the overall design. Sensing people are often practical and realistic. Intuition is about “the big picture”, the meaning and connection behind the initial information. People with a preference for Intuition enjoy concepts and theory, and they can be quite abstract. Typically they look at the overall design first to understand then how the single parts contribute to the whole. Thinking people make their decisions based on objective impersonal logic, and are often good at analyzing and solving problems rationally. They focus on tasks rather than on relationships. Thus they may seem cold or detached to people with a preference for Feeling. Feeling people base their decisions mainly on their value systems. They focus on the effect their decisions have on other people and their feelings, and they are good at understanding others. Their behavior may seem overly emotional and irrational to Thinking Types. People preferring Judging like to have the external world organized and orderly. They tend to make plans and stick to them. They are decisive and like to have things done. At times they may seem rigid and inflexible to other types. People with a preference for Perceiving like to explore the world rather than organizing it. They are spontaneous and flexible. They prefer to gather information and leave things open. This may come across as disorganized and irresponsible to Judging people. Understanding the Myers-Briggs Type Indicator® and your type is extremely helpful in various areas of your life. The MBTI® supported me personally in a career transition and to improve relationships with others. Today I use the MBTI® with my coaching clients: leaders learn the skills to lead people to sustainable success. Organizations appreciate diversity and boost team performance. Individuals grow personally & professionally. MBTI® by Vivo Coaching in Bangkok, Thailand: giving leaders the skills to lead people to sustainable success. Enabling organizations to appreciate diversity and boost team performance. Helping individuals grow personally & professionally.